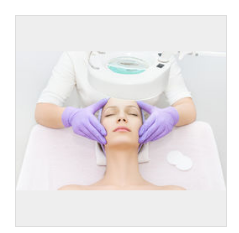 During the consultation, I ask a bunch of questions, take a close look at your skin visually with a mag lamp, look at your underlying pigmentation, oil secretions and skin density under a UV lamp, and use a state of the art skin scanner so that I can view your pore size, skin density, bacteria levels, elasticity and hydration levels. This takes up to 1 hour (I talk a lot! 😜) Then I send a lengthy follow up report with my suggestions for your best course of action to optimise your skin based on skin specific supplements, topical cosmeceutical skincare (I work with 11 different brands so I can cherry pick the best products) and salon treatments, of which you may do 1, all or none! Even if you don't choose to go with the products I will recommend for you, I will at least let you know where you are doing both the right and wrong things with your current skincare regime and hopefully dispel a lot of skincare myths! I can also colour match you for Jane Iredale 100% mineral makeup which truly is skincare makeup. I charge £40 for this due to the 1 hour appointment and 1 hour report preparation. Many people stop at that point, but for others, if time, budget and motivation allows them to, they will see me for facial treatments as well.